Landscape may be further reviewed under the following specific categories: cultural landscape, landscape ecology, landscape planning, landscape assessment and landscape design. Landscape art depicts scenery such as mountains, valleys, trees, rivers, and forests. Sky is almost always included in the view, and weather usually is an element of the composition. In the first century A.D., Roman frescoes of landscapes decorated rooms that have been preserved at Pompeii and Herculaneum. 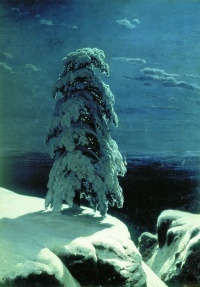 Traditionally, landscape art depicts the surface of the earth, but there are other sorts of landscapes, such as moonscapes, for example. Early in the fifteenth century, landscape painting was established as a genre in Europe, as a setting for human activity, often expressed in a religious subject, such as the themes of the Rest on the Flight into Egypt, the Journey of the Magi, or Saint Jerome in the Desert. In Europe, as John Ruskin realized, and Sir Kenneth Clark brought to view, landscape painting was the "chief artistic creation of the nineteenth century", with the result that in the following period people were "apt to assume that the appreciation of natural beauty and the painting of landscape is a normal and enduring part of our spiritual activity"
It is believed that the word land, landscipe or landscaef entered the English language some time after the 5th century. These terms referred to a system of human-made spaces in the land - spaces such as fields with boundaries though not necessarily defined by fences or walls. It also referred to a natural unit, a region or tract of land such as a river valley or range of hills as occupied by a tribe or later, ruled by a feudal lord. The term is similar in meaning to the German landschaft referring to a small administrative unit or region. The term fell into disuse and by the time of the Domesday Book in the 11th century the word did not appear in any translation from the Latin. The modern form of the word with its connotations of scenery appeared in the late 16th century when the term landschap was introduced by Dutch painters when referring to paintings of inland natural or rural scenery. Landscape, first recorded in 1598, was borrowed as a painters' term from Dutch during the 16th century, when Dutch artists were on the verge of becoming masters of the landscape art genre. The Dutch word landschap had earlier meant simply 'region, tract of land' but had acquired the artistic sense, which it brought over into English, of 'a picture depicting scenery on land'. According to Jackson: "From 1577 with Harrison's Description of Britain onwards, a new awareness of the aesthetic nature of landscape emerged as a new kind of topographical writing flourished...". Originally the term was translated landskip which the Oxford English Dictionary refers to as the corrupt form of the word, gradually to be replaced by landscape. The English word is not recorded as used for physical landscapes before 1725. Following a lengthy analysis concentrating on the German term landschaft, Richard Hartshorne defined landscape as referring to "the external, visible, (or touchable) surface of the earth. This surface is formed by the outer surfaces, those in immediate contact with the atmosphere, of vegetation, bare earth, snow, ice, or water bodies or the features made by man." Hartshorne differentiated the term from region which he considers is larger and more flexible in size. He eliminated sky on the basis that the atmosphere is simply the medium through which the Earth's surface is viewed and also excludes underground mine workings, the soil beneath vegetation and rainfall. However he included moveable objects noting that a view of Broadway (New York City) without traffic would be incomplete. He ignored the inclusion of oceans in landscape. He opposed perception of landscapes by other than sight, e.g. sounds and odours, on the grounds that these do not contribute to a unified concept. 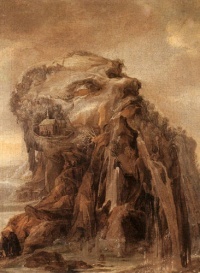 In regard to the concept of natural and cultural landscapes that Carl Sauer among others differentiated, he stated "the natural landscape ceased to exist when man appeared on the scene". While admitting the term primeval landscape could refer to pre-human landscapes he considered the present natural landscape is "a theoretical concept which never did exist". During the 1920s and 1930s, attempts were made to construct methodologies that made landscape the essential if not exclusive task of geography. This stemmed from Sauer's view that the role of geography was to systematically examine the "phenomenology of landscape". Sauer viewed landscapes broadly as areas comprising distinct associations of forms, both physical and natural, and regarded landscape study as tracing the development of natural landscapes into cultural landscapes. By the 1940s, this emphasis had passed as geographers found that the difficulties associated with reconstructing the past were forbidding and at odds with their primary concern with the present world. The concept of a natural landscape became increasingly questioned with knowledge of human impact on the environment. More recent geographers have addressed the subjective attributes of a place within humanistic geography thus crossing the bridge between the objective and the subjective assessment of an area. The popular conception of the landscape that is reflected in dictionaries conveys a particular and a general meaning; the particular referring to an area of the Earth's surface and the general meaning being that which can be seen by an observer. With greater attention to the environmental perception by psychologists over recent decades, landscape is regarded as the raw material with which to study human perceptions and human information processing. Thus Daniels & Cosgrove defined landscape, not in physical terms but as an outward expression of human perception: "a landscape is a cultural image, a pictorial way of representing, structuring or symbolising surroundings." Meinig combined the physical and the psychological: "any landscape is composed not only of what lies before our eyes but what lies within our heads.". In recent decades the term environment has gained wide usage. Jay Appleton (see Environmental psychology) distinguished environment from landscape by referring to the latter as "the environment perceived". An advantage which the term environment has over landscape is, as Bourassa noted, that environment can refer more readily to urban scenes although the term urban landscape is also in common usage. As the term environment embraces the total physical, biological, cultural and aesthetic components of an area, it is generally regarded as too broad and encompassing a term for landscape. The terms scene, scenic and scenery are inadequate descriptions of landscape. With its roots in the theatre where a scene describes a portion of a play, so a scene can describe a portion of a landscape. Scenery, which describes the decorative backdrops used on a stage, also refers to the general appearance of a place, particularly a picturesque view. While it can be used interchangeably with landscape it does not convey the same depth of meaning. The term landscape aesthetics or just aesthetics is frequently used in the literature. Aesthetics has a more controversial origin than landscape. It derived from the Greek aesthesis meaning "sense perception". The term was used as the title of the book Aesthetica [1750-58] by Alexander Baumgarten [1714 - 62], a minor German philosopher who incorrectly applied the Greek term to a critique of the beautiful or the theory of taste (sociology). Thus the term which originally applied to the broad field of sense perception was restricted to the area of taste. Immanuel Kant in 1781 criticised this use and applied it in accordance with its classical meaning "the philosophy of sensuous perception". However, the corrupted term aesthetics gained popular acceptance entering England after 1830 and, according to the Oxford English Dictionary, within a century of the coining of the meaning by Baumgarten, it was in use widely throughout Europe. The dictionary definition of aesthetic perpetuates Baumgarten's error and defines it as "things perceptible by the senses as opposed to things thinkable or immaterial", "pertaining to the sense of the beautiful or the science of aesthetics"Macquarie Dictionary, 1981., or "of, relating to, or dealing with aesthetics or the beautiful". Aesthetics is regarded as a branch of philosophy, that which "deduces from nature and taste the rules and principles of art, the theory of the fine arts; the science of the beautiful..." or "[that] dealing with the nature of the beautiful and with judgements concerning beauty". Thus landscapes have often been the subject of inquiry within the broad framework of aesthetics in the quest for an understanding of beauty. Unless indicated otherwise, the text in this article is either based on Wikipedia article "Landscape" or another language Wikipedia page thereof used under the terms of the GNU Free Documentation License; or on original research by Jahsonic and friends. See Art and Popular Culture's copyright notice. This page was last modified 17:25, 30 January 2018.